Hammered Silver Wedding Ring : LOVE2HAVE in the UK! 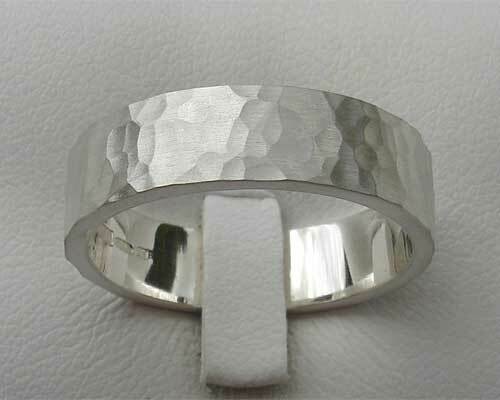 A fashionable, 6mm width hammered silver wedding ring in a matt finish. 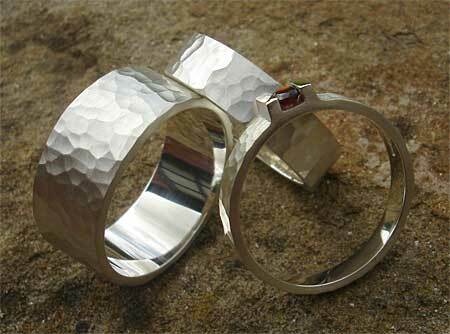 This ring makes a great ring to match the contemporary silver engagement rings on our site - see the image. Further examples of how this ring looks when paired with these rings are in the bridal rings section of the website found in this wedding rings category and featuring matching differing widths and finishes for him and her. Other widths are also available. The range of designer silver engagement rings with their coloured stones make perfect budget wedding ring sets. You can buy both plain wedding rings for the bride and groom and also the engagement ring in a single purchase. We may even be able to offer you a special price for three rings so do contact us first for this offer and any other enquiries regarding specific widths and finishes.